According to Snap’s S-1 filing for its IPO, of the $400 million in revenues the company has, $360 million is made by selling “Geofilters,” or photo filters based on location, which advertisers can buy. So owning the patent on that concept would seem pretty crucial. But Snap has never had such a patent, until now. Mobli, an Instagram competitor launched six years ago that failed to get ahead of its competitor, actually patented the idea of Geo-photo filters in 2012, after launching it the previous year. Sources say Snap wanted the patent to protect itself from future litigation. The patent (US#20160373805, US#9459778) was named Methods and Systems of providing visual content editing functions. The specific nature of the patent covered server-side filters, meaning the filter was coming from the server instead of from inside the app, which means the app itself doesn’t have to be updated every time there is a new Geo-photo filter to push. TechCrunch understands that Mobli first spoke to Facebook about selling the patent. Facebook “100% wanted it,” according to one source. However, other Silicon Valley sources poured scorn on the idea that Facebook had even been offered the patent, with one source familiar with both companies commenting that Mobli wasn’t on the radar of local power players. A Facebook spokesperson said the company had no comment to make. Whatever the case, had Facebook secured the patent, it would have destroyed Snap’s ability to garner revenues from geo-filters, and thus Snap’s main source of income. Typically patents can cost $10,000 to $300, or up to a million dollars. The most expensive in Israel to date was a $2.7 million patent to do with Google Maps. 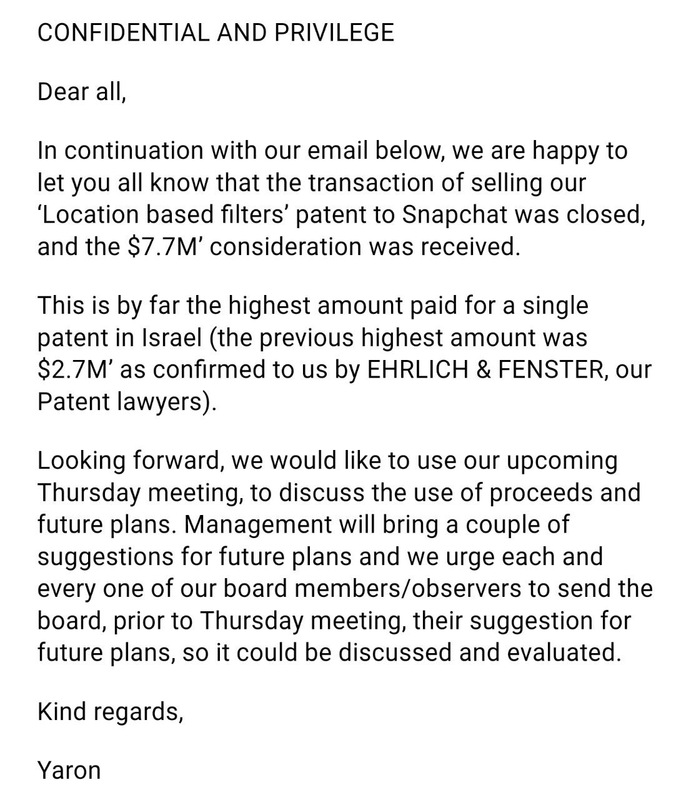 Mobli’s original patent for Geofilters was approved in 2014, long before Snapchat created the Geofilters feature. Asked to confirm the story, Moshe Hogeg replied to TechCrunch with “No comment.” We have reached out to Snap for comment.